With only four ingredients, this broccoli cheese soup couldn't be easier, and the crock pot makes cooking nearly hands-free. It's an excellent soup to fix on a cold winter day. Put it on in the morning and come home from work (or play) to a crock pot of creamy broccoli cheese soup. Or fix it and refrigerate it for lunch the next day. 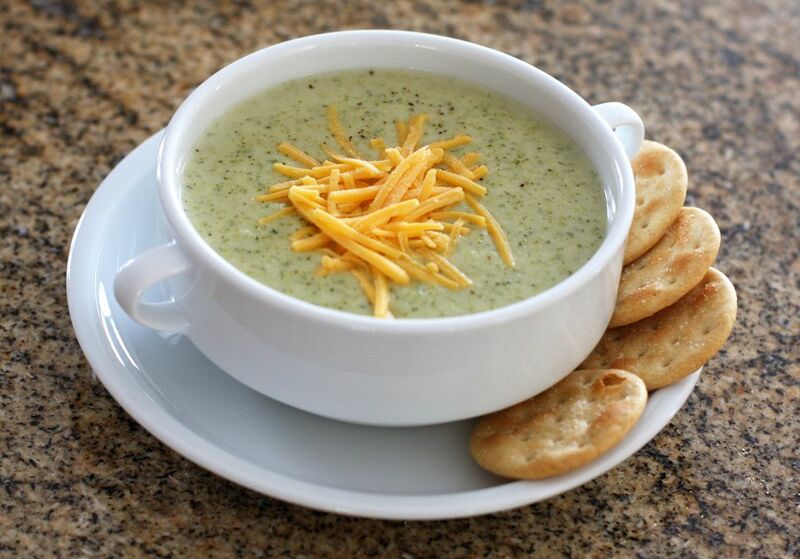 Thanks to John G. for sharing this tasty broccoli cheese soup. To add a burst of color and some extra flavor and texture to the soup, feel free to add some finely diced steamed carrots or finely chopped red bell pepper to the finished soup. To lighten the soup up a bit, use half cream and half chicken broth, or use milk and add it just before the soup is done. Garnish the soup with some shredded cheddar cheese or croutons. This recipe makes enough for six, and it's incredibly easy to scale up for a potluck or special gathering. If you do take it along to a party or big dinner, serve it hot right from the slow cooker. Serve it with sandwiches or a chopped or tossed salad for a delicious lunch or light supper. For a stovetop version made with a homemade sauce, take a look at this broccoli and cheddar cheese soup. Combine all ingredients in the crockery insert of a slow cooker. Heat for about 2 to 3 hours on low, or until the broccoli is tender and the soup is hot. If desired, blend some or all of the soup in the blender. Or use an immersion blender. Cut cooking time by steaming the broccoli before adding it to the slow cooker. Top the soup with shredded cheddar cheese, croutons, bits of cooked bacon, or diced ham. To cook the soup on the stovetop, thaw the broccoli. Combine all ingredients in a large saucepan. Bring to a simmer over low heat and continue cooking for about 20 to 30 minutes. Do not let the soup boil. If you're transporting the soup, cook it first and then wrap the slow cooker in newspapers or towels to keep it hot. When you get to the event, plug it in, set it on low, and serve.